Four years ago a group of CIOs, library deans, and industry leaders came together to discuss the risk to future scholars if the digital output from academia is not properly preserved. As they examined the issue they became alarmed that in spite of best efforts to date, the risk was very high if nothing was done to protect against natural disasters, technological failure, or institutional failure. In recent times institutions have created backup systems that help to prevent total loss of data, but in most cases, that content is still stored in geographic proximity to the original copy, still leaving institutions vulnerable to natural disaster, political uncertainty, and business performance issues. This problem was put before a group of university presidents, CIOs and library deans and they decided that society needs a system dedicated to collaboratively preserving the digital record. Leaders from over sixty institutions pledged support to create a large-scale digital preservation service that is built to last beyond the life spans of individuals, technological systems, and organizations. Work began in earnest to develop a solution to provide members of the academy and their successors with peace of mind that future access to their scholarly resources will be available in the event of disruptive change in administrative or physical institutional environments. After three years with teams of experts working to develop the technological infrastructure and with focused effort dedicated to writing and negotiating legal agreements, the Digital Preservation Network is open and is accepting content from members. The five nodes that make up the DPN network are themselves preservation repositories with varying technical architectures, but together they communicate with each other to replicate content and perform fixity checks and repairs. Member institutions may currently deposit content into DPN via a portal developed by Duraspace and UCSD/Chronopolis called DuraCloud Vault or via the Academic Preservation Trust (APTrust) dashboard for current APTrust members. The deposited content is then replicated throughout the DPN federation that also includes Hathitrust, the Texas Preservation Node, and the Stanford Digital Repository. Members that make deposits have signed deposit agreements that allow for succession rights for the content should their institution fail or should institutional priorities change. Members initially may deposit 5TB annually of content into DPN as a part of their membership contribution. The content will be preserved for a minimum of twenty years even if the member institution decides not to participate or should their institution fail. DPN operates as an independent organization under the umbrella of the not-for-profit Internet2, a community of international leaders in research, academia, industry, and government who collaborate on the adoption of innovative technologies. Governance of DPN is by a separate Board of Directors, chaired by Michael McRobbie, president of Indiana University. Joining Dr. McRobbie on the board are four other university presidents and chancellors as well as CIO's, librarians and industry leaders. As a membership organization DPN is guided by the work of committees including Membership, Services, Pricing, Heavy Users, Technical Advisory, and Preservation Metadata. Additionally, there is an Advisory Committee that coordinates the recommendations coming from the committees and makes recommendations for action by the DPN staff or makes recommendations for items to take forward to the Board of Directors. The committees are currently examining ways to open up DPN to various kinds of members including small institutions, library consortia, and research data consortia. Committees are also looking at the pricing model and controlling costs while looking at ways to vastly increase the capacity of DPN for members with very large potential deposits. For more information about the Digital Preservation Network go to http://www.dpn.org or contact DPN Chief Operating Officer and Services Manager, Mary Molinaro at mary [at] dpn.org. Cultural and scientific content is available in different repositories, distributed within archives, libraries and museum collections across Europe. These collections encompass different kinds of data, among them scientific publications, audio files, images and videos. While such cultural and scientific content is usually openly accessible, accessing it takes efforts and requires in-depth knowledge about the existing repositories and portals  a major hurdle that not all users can successfully overcome. Therefore, EEXCESS pursues the idea of giving users effortless access to Europe's rich digitally available, cultural heritage content. Through contextualized and personalized recommendations of cultural and scientific content we aim to bring the content to the user instead of bringing the users to the content. Metadata mapping: The metadata mapping is responsible for harmonising different metadata source-formats into one unified EEXCESS metadata format, which is an adaption of the Europeana EDM format and geared towards recommendations. Federated search: The federated search engine distributes the search request and the user profile to all connected partner systems, and aggregates the results based on the user profile. Currently EEXCESS provides federated access to over 140 millionen scientific and cultural objects aggregated from large aggregators like Europeana or Mendeley as well as from smaller memory organisations like for example the KIM Portal in Baselland. User context detection and profiling: The user context detection component is a client component responsible for detecting the users information need, generating a suitable search query and inferring a descriptive user profile from the digital user behaviour. Content injection and visualisation: The injection components are responsible for including the retrieved content in a suitable manner in the user's current digital whereabouts, e.g. into the blog entry, the user is currently editing. Visualisations support the investigation and filtering of retrieved results. Privacy preservation: Because the user context detection collects information about user behaviour, EEXCESS implements a privacy-preserving, personalized search to ensure user privacy. Search requests and user profiles are sent through a privacy proxy component ensuring unlinkability (detaching the query from the actual user) and indistinguishability (hiding a single user within a larger group) of requests. EEXCESS has developed different clients suitable for different user tasks. Content creation gives access to cultural heritage content while writing and is available as Google Docs plugin, a Moodle server plugin and a Wordpress Plugin. Content consumption automatically enriches web pages with cultural and scientific content when users browse the Web through a Chrome Browser extension. 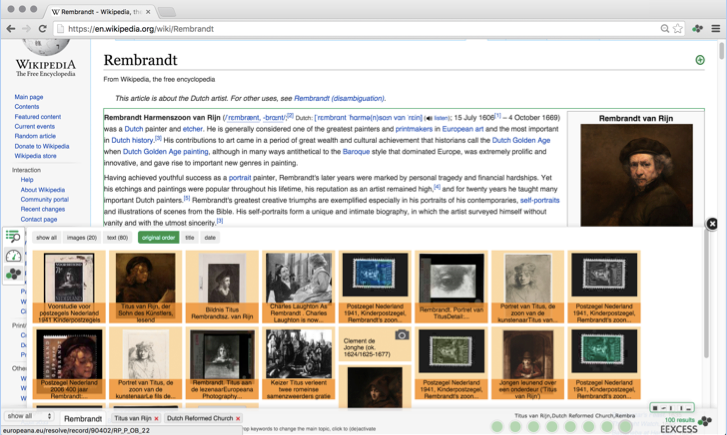 The figure below shows an example of a user reading a web page on "Rembrandt". EEXCESS identifies the user's information need and searches for images related to Rembrandt in digital libraries. The EEXCESS results have been successfully evaluated in various test beds like supporting teachers in schools creating lecture material or students when researching for courses. All clients are publicly available together with their source code. We thereby hope to achieve an uptake of the developed client technologies by a broad community to ensure the distribution and engagement with Europe's digital cultural heritage. You are invited to participate in a survey that will help us learn more about filenaming conventions in use within the Library, Archive, and Museum (LAM) community. The principal investigators hope to learn about the broader context in which such conventions are being used and gauge the importance of various filenaming concepts in the LAM community, with an eye toward determining current best practices in the field. You must be 18 years or older and employed (either full- or part-time) by a LAM organization to participate. The online survey involves questions about your current filenaming practices at your institution or organization. Beyond demographics, all questions will address filenaming convention issues. This survey is expected to take about 15 minutes to complete. Participation in this project is anonymous and completely voluntary. You may access the survey by clicking the link below. The survey tool will close to new responses on April 15, 2016. While you will not directly benefit from participation, your participation may help to inform the development of best practices for filenaming in the future. The results of this study may be published in professional and/or scientific journals. It may also be used for educational purposes or for professional presentations. However, no individual subject will be identified. We thank you greatly for your attention, and we sincerely hope you will participate! This project has been reviewed by the University of Houston Committee for the Protection of Human Subjects (713) 743-9204 and by the California State University, Northridge Office of Research and Sponsored Projects (818) 677-2901. To increase access to the results of federally funded scientific research, the U.S. National Science Foundation (NSF) published its public access plan in March 2015. To implement this plan, NSF updated its Proposal & Award Policies & Procedures Guide (PAPPG), which specifies the agency's proposal and award process. In FY 2017, the foundation will continue to monitor, enhance, and expand the operation of NSF's Public Access Repository, which has been developed in a partnership with the U.S. Department of Energy, Office of Scientific and Technical Information (DOE/OSTI). The system enables the public to access publications that NSF has supported and has been integrated with NSF's legacy mission applications and reporting system to minimize burden. NSF will also implement additional features that enhance usability and will initiate planning activities to engage at least one additional service. NSF's implementation engages the research and scientific community and leverages existing infrastructure and resources across the government and the private sector to minimize the burden on awardees, investigators and staff. Stand up the initial implementation of the NSF Public Access Repository (NSF-PAR) at http://par.nsf.gov. This implementation will provide search capability and will be integrated with reporting and award management systems as well as existing award search services on maintained on NSF.gov and Research.gov. Pilot the system with a self-selected set of external users. Monitor performance and remediate problems as feasible. Provide APIs to enable appropriate, third-party use of the information. Initiate planning activities to enable expansion to additional Federal agency partners. March 3, 2016  "The Institute of Museum and Library Services (IMLS) and 15 national funding agencies from 11 countries on three continents announced the fourth round of the Digging into Data Challenge. Since 2009, the Digging into Data grant competition has provided nearly $12 million in funding for international research projects that use "big data" sources and methodologies to address questions in the social sciences and humanities." "This year's competition is presented under the auspices of the Trans-Atlantic Platform (T-AP), a consortium of sixteen international funders of social sciences and humanities research from Europe, South America, and North America. U.S. funding agencies are IMLS, the National Endowment for the Humanities, and the National Science Foundation. With new funders from Europe and, for the first time, South America, research teams will have opportunities for more diverse collaborations and subjects of inquiry...."
"...The Digging into Data funding opportunity is open to international projects that consist of teams from at least three member countries, and must include partners from both sides of the Atlantic. Projects must address a research question in humanities and/or social sciences disciplines by using large-scale, digital data analysis techniques, and show how these techniques can lead to new insights. Research partners will receive funding from their own national funding agencies for projects that can last for up to 36 months." March 1, 2016  "Knowledge Unlatched (KU) is delighted to announce the 'unlatching' ('Unlatching' is the KU term defining the way KU enables the collaborative and sustainable way of making content available on Creative Commons licences and fully downloadable by the end user.) of 78 new titles. These titles have been made Open Access through the support of both individual libraries and library consortia from across the globe." "This brings the total to over 100 titles now available as Open Access since 2014, when KU celebrated the success of its Pilot Collection with 28 Humanities and Social Sciences monographs from 13 publishers being unlatched by nearly 300 libraries worldwide." "Now these 78 new books from 26 publishers (including the original 13 participants) have been successfully unlatched by a similar number of libraries in 21 countries along with support from a number of library consortia, who together raised over $1 million. The books are being loaded onto the OAPEN and HathiTrust platforms, where they will be available for free as fully downloadable PDFs." March 1, 2016 announcement from Becky McGuinness, Open Preservation Foundation  "The latest version of veraPDF is now available. This marks the end of the PREFORMA project's first re-design phase." Release notes are published at: https://github.com/veraPDF/veraPDF-library/releases/tag/v0.10.7 "
"veraPDF is building the definitive, open source PDF/A validator. Please download and test the software. If you encounter problems, or wish to make suggestions, please add them to the project's GitHub issue tracker https://github.com/veraPDF/veraPDF-library/issues." "Led by the Open Preservation Foundation and the PDF Association, the veraPDF consortium is developing the definitive open source, file-format validator for all parts and conformance levels of ISO 19005 (PDF/A). The software is designed to meet the needs of memory institutions responsible for preserving digital content for the long term. http://verapdf.org/." For more information, please contact Becky McGinness at becky [at] openpreservation.org. February 29, 2016  "The College of Information Studies, Maryland's iSchool, announces a new Bachelor of Science in Information Science (BSIS) degree. Building on the iSchool's tradition of preparing high-impact information professionals, the BSIS degree will fill a growing demand for students skilled at working with information in a variety of fields including government, healthcare, education, technology, and policy." "Students from a wide range of backgrounds will find the new program relevant and useful in building and launching their professional careers. A full suite of courses will be offered beginning Fall 2016, drawing from the iSchool's strengths in strength in human-computer interaction, digital libraries, cloud computing, information access, e-government and social media. For more information about the upcoming BSIS curriculum, see http://ischool.umd.edu/undergraduate." February 26, 2016  "Libraries have a direct and immediate stake in the outcome of the Apple case, as patrons have 24/7 access to library materials and resources via their smart phones, tablets and mobile devices. Sari Feldman, president of the American Library Association (ALA) released the following statement in response to a federal court order that requires Apple to develop a new tool to eliminate specific security protections the company built into its phone software, in order to assist the Federal Bureau of Investigation in unlocking encrypted messages." "'The American Library Association (ALA) is saddened and outraged at the act of terrorism in San Bernardino last December,' stated Feldman. 'This senseless act of violence should not be used to justify compromising the privacy of library users and, indeed, all Americans.'" "'Along with scores of civil liberties organizations, technology companies, and eminent security researchers worldwide, the ALA shares concerns regarding the intended or unintended creation of a 'backdoor' into Apple's or any other company's encryption systems. Library patrons have a right to privacy, as many access library catalogs and databases via their mobile devices.'" February 25, 2016  "The National Information Standards Organization (NISO) seeks comments on the draft Altmetrics Data Quality Code of Conduct, NISO RP-25-201X-3, one output of a multi-pronged, multi-phase project that aims to build trust in and adoption of new methods of assessing impact. Further draft outputs from two other working groups, addressing altmetrics definitions, use cases, specific output types, and use of persistent identifiers, are expected to be released for public comment in the coming weeks." "Altmetrics are increasingly being used and discussed as an expansion of the tools available for measuring the impact of research in the knowledge environment. The NISO Alternative Assessment Metrics (Altmetrics) Initiative was begun in July 2013 with funding from the Alfred P. Sloan Foundation to address several areas of limitations and gaps that hinder the broader adoption of altmetrics. This document is one output from this initiative's Phase 2, and is intended to help organizations that wish to use altmetrics to ensure the consistent generation and aggregation of altmetric data across the community. This Altmetrics Data Quality Working Group studied and discussed issues of data quality in the altmetrics realm, an essential aspect of heterogeneous data before metrics can be used for research and practical purposes...."
"...The draft Code of Conduct Recommended Practice is open for public comments through March 31, 2016. To download the draft or submit online comments, visit the NISO Altmetrics Initiative webpage at http://www.niso.org/topics/tl/altmetrics_initiative/." February 25, 2016  "Today the Getty Research Institute announced the release of the Getty Scholars' Workspace, a free downloadable tool designed specifically for collaborative humanities research." "Getty Scholars' Workspace is an online environment designed to support collaborative art-historical and humanities research, where research teams can examine digital surrogates, build bibliographies, translate and annotate texts, share and annotate images, and exchange ideas. With the Scholars' Workspace, research and communication are consolidated into a single online location accessible from anywhere...."
"...A project conducted in the Getty Scholars' Workspace could result in an exhibition, a seminar, a digital or print publication, a scholarly talk, or something else entirely. While it is not designed to produce these outcomes itself, the Scholars' Workspace helps research teams organize their materials, such as texts and images, and facilitate collaborative analysis and investigation." "The Getty Scholars' Workspace can be used with digital content from any museum or archive of any person or institution. It does, however, require technological expertise and will work best for users who have technical support in their own institutions. An installation guide and user manual are downloadable from the Scholars' Workspace web page." February 24, 2016  "President Obama announced today his intent to nominate Dr. Carla Hayden, a former president of the American Library Association (ALA) and the current Chief Executive Officer of the Enoch Pratt Free Library in Baltimore, Maryland as the 14th Librarian of Congress. Commenting on the announcement, ALA President Sari Feldman said:"
"'The President could not have made a better choice. Hats off to President Obama for nominating Dr. Hayden, a professional librarian uniquely positioned with the leadership and management skills and understanding of digital technology to make the Library of Congress the preeminent national library in the world, highly-valued by and serving all Americans as a treasured resource. We look forward to working closely with her to further librarians' bedrock principle that all Americans everywhere deserve and must have equitable access to the information that they need to succeed and lead productive lives in the digital age.'" "Dr. Hayden, who served as President of ALA from 2003 to 2004, would be the first woman and first African American Librarian of Congress. She is a veteran of the Chicago Public Library." February 24, 2016  "Open eBooks a new initiative and e-reader app that will make thousands of popular, top-selling eBooks available to children in need for free, is launching today. First Lady Michelle Obama is releasing a video today raising awareness of the new opportunity for children. The initiative is designed to address the challenge of providing digital reading materials to children living in low-income households, and offers unprecedented access to quality digital content, including a catalog of eBooks valued at more than $250 million." "President Obama announced a nongovernmental eBooks effort in support of the ConnectED Initiative (link is external) at the April 30 Kids Town Hall (link is external) held by the White House at the Anacostia Branch of the District of Columbia Public Library. ConnectED is multi-pronged effort designed to provide all youth with access to high-quality digital learning tools. Since it launched, over 20 million more students have been connected to high-speed broadband in their schools and libraries and millions more are taking advantage of its free private sector resources. Open eBooks complements the new digital infrastructure to provide an opportunity for kids in need to have a world-class eLibrary in their homes." February 24, 2016  "The Knight News Challenge opens for applications today offering a share of $3 million for ideas that address the evolving role of libraries in the digital age. The challenge seeks to uncover new ways to extend and strengthen the role of libraries as essential spaces for people to learn, acquire information, and exchange ideas and perspectives." "People anywhere in the United States can participate by providing a brief answer to the question: How might libraries serve 21st century information needs?..." "...This is the second Knight News Challenge on Libraries. In January 2015, Knight announced 22 winners of the first News Challenge on Libraries. Past News Challenge winners have created innovative solutions aimed at helping libraries meet the demands of the digital age and build more informed communities. They include: San Jose Public Library, which developed online tools to help people understand their digital privacy rights; Library for All, which makes educational content available at libraries and schools across the developing world; and New York Public Library, which allows city residents to borrow portable Wi-Fi hotspot devices"
"The application period for this round on libraries will close at 5 p.m. ET Monday, March 21, 2016. A team of advisers will help Knight to review the entries. Knight will announce winners in June 2016." February 23, 2016  "Thirty-nine individuals have been selected for participation in the 2016 Leading Change Institute (LCI). The Institute, sponsored by CLIR and EDUCAUSE, will be held in Washington, DC, June 12-17, 2016." "This year, CLIR awarded its first Sponsors Scholarship, which is given to a participant from a CLIR sponsoring organization. Kelcy Shepherd, head of digital programs at Amherst College, is the recipient of this year's award, which covers half the cost of LCI tuition. 'I am passionate about helping academic libraries more effectively step into a campus leadership role for the creation, curation, management, delivery, and preservation of scholarly, cultural, and administrative digital content,' said Shepherd. 'I believe in libraries' ability to initiate and foster positive, compassionate change, particularly in areas of diversity and inclusivity, community building, and universal access to information.'" February 19, 2016  "The Institute of Museum and Library Services (IMLS) today released its Fiscal Year 2016 allotment table for 56 State Library Administrative Agencies (SLAAs), totaling $155,789,000. These annual grants to the 50 states, the District of Columbia and the U.S. Territories represent the largest source of federal funding support for library services in the United States...."
"...States and their subrecipients have used Grants to States funds for a range of projects that respond to the purposes and priorities outlined in the Library Services and Technology Act (LSTA). These have included summer reading programs, access to electronic databases and e-books, and programming targeted to underserved populations." February 17, 2016  "Members of the National Standards Organization (NISO) have approved a new project: the development of a Recommended Practice for Tracking Link Origins in a Networked Information Environment. As libraries strive to improve the ways in which users access their collections, gaining a definitive understanding of where a user began his or her library search before ultimately arriving at library-licensed content is an important factor for library staff in determining the value of a platform and how to allocate resources. Additionally, publishers may turn to web log analysis to track where users are coming from. In many access scenarios, the use of link resolvers-a crucial technology tool-may unintentionally obscure the original citation source. This new NISO initiative will create effective and scalable options to allow content hosts and individual libraries to determine original sources of links, and provide information on how to obtain and process more accurate statistics for this data." "Participation in the NISO initiative is encouraged from libraries, publishers, discovery providers, providers of abstracting and indexing databases, content aggregators, link resolver vendors, and associated technology providers, such as administrators of DOI handle servers. Committee members should be drawn from the communities that will benefit from these new features and who have the skill set to produce a specification that is effective in using current approaches to web services." February 11, 2016 announcement from Ardie Bausenbach, Library of Congress  "In just a year and a half since it first issued the document which has become the Recommended Formats Statement (http://www.loc.gov/preservation/resources/rfs), the Library of Congress has been pleased to see the degree to which the community of stakeholders involved with creative works has engaged with it and valued it. The Recommended Formats Statement was created to describe hierarchies of the physical and technical characteristics of analog and digital formats, which will best maximize the chances for preservation and continued accessibility of creative content...."
"...The Library wants to ensure that the Statement remains a useful document and guide, both for its own collection building and preservation needs and for those of others who are treating this as a valuable resource. To do this, the Library is committed to carry on with its annual review of the Statement. The teams of experts here at the Library of Congress who work on the six categories which make up the Statement will undertake that review from April to June, with the goal of making the Statement as accurate and useful as possible for all parties who have an interest in the preservation and long-term access of creative works. Already we are looking at potential changes and improvements, such as the possible inclusion of FLAC (Free Lossless Audio Codec) in our hierarchy of audio file formats." "So, we are requesting that any and all of you who are involved with creative works and have an interest in ensuring they last and remain accessible, please examine the Recommended Formats Statement and provide your input, comments and feedback to us, so that we can make it the best it can be. The Library of Congress looks forward to receiving such input through March 31, 2016. It should be sent to the Library through one of the e-mail contacts listed on the Recommended Formats Statement website or through the e-mail address: abau at loc.gov. For more information, please contact Ted Westervelt [thwe at loc.gov]." February 9, 2016  "President Obama today released his FY 2017 budget request, which includes $230,000,000 for the Institute of Museum and Library Services (IMLS). IMLS, which will celebrate its 20 year anniversary this year, provides leadership for the nation's 123,000 libraries and 35,000 museums through grant making, policy development, and research. The Congressional Justification, which contains detailed information on the Budget Request, is now available at https://www.imls.gov/sites/default/files/publications/ documents/fy17cj.pdf on the IMLS website, as well as the IMLS Budget table: https://www.imls.gov/sites/default/files/budgettable_14-17.pdf." "'Museums and libraries serve as anchors in communities all across the country,' said IMLS Director Dr. Kathryn K. Matthew. 'This budget capitalizes upon the agency's role as a convener and a grant maker in order to strengthen our nation's museums and libraries. It also includes several focused initiatives-such as building capacity in collections care skills and developing community-based solutions for veterans and military families-where we hope to examine best practices in the field, and where possible, scale more broadly.'" Multi-year trend shows growth in online enrollments continues to outpace overall higher ed enrollments. February 9, 2016  "The 2015 Survey of Online Learning conducted by the Babson Survey Research Group in partnership with the Online Learning Consortium (OLC), Pearson, WCET, StudyPortals, and Tyton Partners, reveals the number of higher education students taking at least one distance education course in 2015 is up 3.9% over the previous year. Growth, however, was uneven; private non-profit institutions grew by 11.3% while private for-profit institutions saw their distance enrollments decline by 2.8%. These and other findings were published today in a report titled, 'Online Report Card: Tracking Online Education in the United States.'..." "...Growth has continued, despite muted support by faculty. The study reveals only 29.1% of academic leaders say their faculty accept the 'value and legitimacy of online education.' The proportion of chief academic leaders reporting online learning is critical to their long-term strategy dropped to 63.3% in the most recent results." Hampshire has earned the generous, seven-figure grant from The Andrew W. Mellon Foundation in response to the College's proposal to remake the College library and centralize academic support services currently dispersed across campus. February 8, 2016  "Hampshire's leaders are invoking the spirit of experimentation that founded the College as they launch a far-reaching initiative to establish the library as the hub of campus learning, a re-imagined space where students can create their projects from concept through collaboration to completion. And a major foundation has endorsed the plan by awarding the College a $1.2 million grant to fund it, enabling Hampshire to pilot a model that promises to benefit other academic libraries." "Hampshire has earned the generous, seven-figure grant from The Andrew W. Mellon Foundation in response to the College's proposal, titled Learning Commons 3.0, for the reinvention of the Harold F. Johnson Library. Hampshire's project team will utilize the funds to develop service models and to modernize and transform the library into an integrated hub of content, tools, and services in support of the College's curriculum." "The plan promises to result in a prototype that benefits libraries throughout the Five Colleges and beyond, creating a model for modern academic and technological requirements. 'Our efforts will provide our consortium colleges and the broader higher ed community with an example and a process for the continued transformation of the role of the library in education,' said Library Director Jennifer King." February 3, 2016  "The Association of Universities in the Netherlands (VSNU) and John Wiley and Sons, Inc., today announced an agreement of unlimited open access publication of Dutch academic articles combined with expanded subscription access to high-quality research...."
"...The negotiations between VSNU and Wiley resulted in an unprecedented agreement covering 2016 - 2019. It provides students and researchers at Dutch universities affiliated to the VSNU with access to all Wiley subscription journal content and enables authors at Dutch universities affiliated to the VSNU to enjoy unlimited open access publication in Wiley's hybrid journals (c.1400), with no publishing charge levied at the article level. This arrangement will contribute to significant growth in open access articles published from the Netherlands...."
",,,The Dutch universities and the Dutch government are very much in favour of open access to academic publications. Open access is also a priority during the Dutch presidency of the EU. VSNU believes open access publications are easier to find, and have the potential to be more frequently cited and reach a larger audience. This benefits not just the academic community, but society and the economy at large." January 28, 2016  "James Shulman, President of Artstor, and Kevin Guthrie, President of ITHAKA, today announced a new strategic alliance between the two nonprofit organizations that will benefit thousands of colleges, universities, schools, museums, and other educational institutions. Artstor, the provider of the Artstor Digital Library of images and the Shared Shelf platform for cataloguing and digital asset management, will now function under the umbrella of ITHAKA, which currently operates the services JSTOR, Portico and Ithaka S+R." "Artstor, JSTOR, and ITHAKA were all created as mission-driven nonprofit organizations with initial support from The Andrew W. Mellon Foundation  a history reflected in the cooperation that has existed to date between Artstor and JSTOR in working to build and preserve shared academic resources. Now, with both operating under the ITHAKA umbrella, Artstor and JSTOR will be better able to collaborate in developing new tools and in taking advantage of core capabilities." "Under the new alliance, Artstor will retain its identity as a 501(c)(3) organization, with management and financial responsibility assumed by ITHAKA. Artstor's extensive network of relationships and terms will remain in place, and its existing products and services will continue to be made available for current and new subscribers." January 28, 2016  "The Berkman Center for Internet & Society at Harvard University is pleased to release Amber, a free software tool for WordPress and Drupal that preserves content and prevents broken links. When installed on a blog or website, Amber can take a snapshot of the content of every linked page, ensuring that even if those pages are interfered with or blocked, the original content will be available...."
"...The release of Amber builds on an earlier proposal from Zittrain and Sir Tim Berners-Lee for a 'mutual aid treaty for the Internet' that would enable operators of websites to easily bolster the robustness of the entire web. It also aims to mitigate risks associated with increasing centralization of online content. Increasingly fewer entities host information online, creating choke points that can restrict access to web content. Amber addresses this by enabling the storage of snapshots via multiple archiving services, such as the Internet Archive's Wayback Machine and Perma.cc." "Amber is useful for any organization or individual that has an interest in preserving the content to which their website links. In addition to news outlets, fact-checking organizations, journalists, researchers, and independent bloggers, human rights curators and political activists could also benefit from using Amber to preserve web links. The launch is the result of a multi-year research effort funded by the U.S. Agency for International Development and the Department of State." Scholarly research is a public investment, and preserving access to this research should be a public goal. January 27, 2016  "Access to scholarly research is essential in ensuring Canada's success in the global information economy and the current commercial publishing model is placing that access at risk. Today, the Canadian Research Knowledge Network (CRKN), a national consortium of 75 universities, represented by their libraries, has launched its Institutional Mobilization Toolkit, a collection of documents and tools to support librarians in communicating challenges of sustainability within the current model to researchers, faculty members and administrators." "In an ecosystem where university libraries have continuously been asked to do more with less, the industry has found itself at a junction where the external and internal funding challenges, as well as an overall lack of understanding of the environment in which libraries must operate, are negatively impacting Canada's ability to ensure our students and researchers have sustainable access to the information required to advance our knowledge economy. The Toolkit acts as a first step by investigating the complexity of the issues from all angles and providing the background necessary for the library community to collaborate with researchers and university administrators on the creation of sustainable, long-term solutions." January 27, 2016  "The Boards of LYRASIS and DuraSpace, two leading member-based non-profit organizations serving libraries, archives, museums, as well as the broader scholarly, cultural heritage and technology communities, have unanimously approved an "Intent to Merge". LYRASIS, which serves more than 4000 members and partner organizations by delivering e-resources, strategic licensing, training and digital technology resources and DuraSpace, a leader in the development and deployment of open source technologies and services that promote durable access and discovery of digital data, will begin next steps to determine the feasibility of a combined organization. These next steps will include a deeper assessment of the individual organizations and how they might partner effectively, seeking community feedback on the proposal during a public phase of the due diligence investigation." "The respective boards unanimously approved an "Intent to Merge", which means the organizations, having done a careful initial investigation, will move into a public phase to consider an official plan and pathway for the potential coming together, including a full analysis of member benefits. The decision to eventually come together is not yet final. In this public phase of investigation, each organization seeks feedback from members of their organizations and will investigate carefully the value of all services, projects, membership models and organizational cultures to ensure a smooth transition for members of both organizations should a merger agreement occur. The missions of both organizations are deeply rooted in the needs of the research, library, archives and museum communities and a shared mission must serve a combined organization membership equally well." January 25, 2016  "John Wiley and Sons, Inc. announced the conversion of five of its leading journals to the Wiley Open Access Program. From January 1st 2016, all articles in Plant Biotechnology Journal, GCB Bioenergy, Health Expectations, Atmospheric Science Letters, and Clinical and Translational Science will be free to read, download and share. The addition of these journals to Wiley's Open Access Program brings the total number of Wiley's open access titles up to 61." "'It is evident that our authors strongly endorse open access publishing,' said Fiona Hutton, Executive Editor of Open Access at Wiley. 'We are confident these established journals will flourish under the open access model.'" "All five journals are now accepting open access submissions, and all articles will be published under a Creative Commons (CC-BY) License, so authors retain the copyright for their work. As part of the Wiley Open Access publishing program, authors, their funding agencies, or their institutions pay an Article Publication Charge (APC) to cover the cost of publishing. Funders and Institutions can pay on behalf of their authors via a Wiley Open Access Account." January 20, 2016  "The National Information Standards Organization's (NISO) 2016 series of Virtual Conferences offers useful six-hour programs featuring recognized professionals discussing topics of immediate and practical value..."
Emerging Tools To Improve Management of Data (Sept 8)"
"Those Training Thursday events are FREE if an organization purchases one of the two available subscription package options." January 20, 2016  "Allen Press, Inc., will present its annual Emerging Trends in Scholarly Publishing Seminar titled Sea Change: Challenges and Opportunities in the Publishing Ecosystem on April 21, 2016, at the Embassy Suites DC Convention Center in Washington DC." "At this event, pioneers and explorers in the field of scholarly and electronic publishing will share their experience, expertise, and insight into the depths of industry collaboration, the shifting identity of libraries, the transformational promise of data, new approaches to the journal publication process, the needs of researchers and authors, and shifting tides in the publishing environment." "The stability of libraries is sometimes threatened by change. Keynote speaker Roger Schonfeld, an expert in the evolving roles of the academic library, scholarly publisher, and learned society, will tell us how he sees libraries adapting and developing new strengths as they find their place in the ecosystem going forward." January 20, 2016  "The results of a recent survey to appear in Learned Publishing highlight how the peer review process  when research is evaluated by experts before it's published  might be improved to better support reviewers who lend their time and expertise. Key findings from the study include the need for additional training and increased recognition for peer reviewers." "Global publishing company Wiley undertook this study in order to identify support gaps and provide recommendations. Almost 3,000 respondents from 115 countries and all major subject areas participated in the survey." 77% of respondents are interested in receiving further reviewer training. Most peer review training comes from journal guidelines or advice from supervisors or colleagues. Reviewers believe that reviewing should carry more weight in their institutions' evaluation process. Reviewers would rather receive feedback and recognition from journals over financial rewards. Journal rank is important to potential reviewers. There is a need to increase the reviewer pool especially in high-growth and emerging regions of the world and among early career researchers." January 20, 2016  "The Council on Library and Information Resources (CLIR) is now accepting applications for 2016 Digitizing Hidden Special Collections and Archives awards. The national competition, funded by The Andrew W. Mellon Foundation, supports digitizing collections of rare and unique content in cultural memory institutions." "Grants of between $50,000 and $250,000 for a single-institution project, or between $50,000 and $500,000 for a collaborative project, may be sought for projects beginning between January 1 and June 1, 2017...."
"...The application process has two phases. The initial proposal round is open, and proposals are due by 5 pm Eastern time on April 5, 2016. The final proposal round is by invitation. Only those applicants whose initial proposals have been approved by the program's review panel will be able to submit a final proposal. Information for applicants, including a link to the online application form, is available at http://www.clir.org/hiddencollections/applicants."